Chiang Mai in Thailand is rich in symbolism and cultural heritage. Values and attitudes held by Thais frame their lives in joy. Being versed in the traditions of Thai people will endear you to them. It will enhance your travel experience, and give you warm memories to cherish. Here we share the novel customs of the delightful people of Chiang Mai. Here’s a brief background for understanding the roots of Thai traditions. Thais place great value on humility. Social status guides behavior. A sense of hierarchy molds communication. Formal gestures are always used with monks, elders, and those of high social standing. The royal family is revered. Daily at 8am and 6pm, the national anthem is played on radio and television. If you are in a government building, park, or public place, follow the lead of locals. They stand silent and attentive, exhibiting respect. You will often hear the phrase “Mai pen rai.” It means “No worries.” This is the general Thai philosophy. It reflects the easygoing nature of Thais. They have a knack for keeping cool in challenging situations. The Thai motto is “Please everyone.” Thais will go out of their way to do this. Thailand is known as “The Land of Smiles.” Smiling comes easily to Thais. In general, the people of Thailand are happy, thankful, and kind. The “wai,” is a respectful gesture. It’s made by pressing the palms together in prayer-like fashion and bowing the head. The wai is used to say hello, thank you, goodbye, and “I’m sorry.” The higher the hands and deeper the bow, the more respect is shown. Bowing low is done in the presence of a monk or elder person. When offering wai to a monk, the thumbs touch between the eyebrows. The wai conveys a subordinate status. Therefore, it is not necessary to offer wai to those rendering a service, such as a taxi driver or waitress. There are over 300 Buddhist temples in Chiang Mai. Here are some suggestions to help you receive the greatest blessing from a temple visit. Bring money for a temple donation. Many temples are free to visit but sustained only by monetary gifts. A typical contribution is 20 baht. Bring a monk offering. Buddhist monks pledge a life of poverty as a sign of their devotion. Everything a monk owns and consumes has been obtained as a gift. Therefore, your offering to a monk will be most appreciated. Your gift can take the form of flowers, fruit, incense, or food. Wear temple attire. Clothing should cover the shoulders and knees. Entrance is denied if a person wears a sleeveless top, flip-flops, shorts, or short skirt. When approaching a temple entrance, step over the door sill. Thais believe that stepping on a threshold brings bad luck. Upon entering a temple, you will need to remove your shoes and hat. When sitting inside a shrine, have your legs and feet pointing behind you. Alternatively, you can sit cross-legged. You will want to wai before a monk. If you have the opportunity to sit down and speak with a monk, position yourself at a lower level. 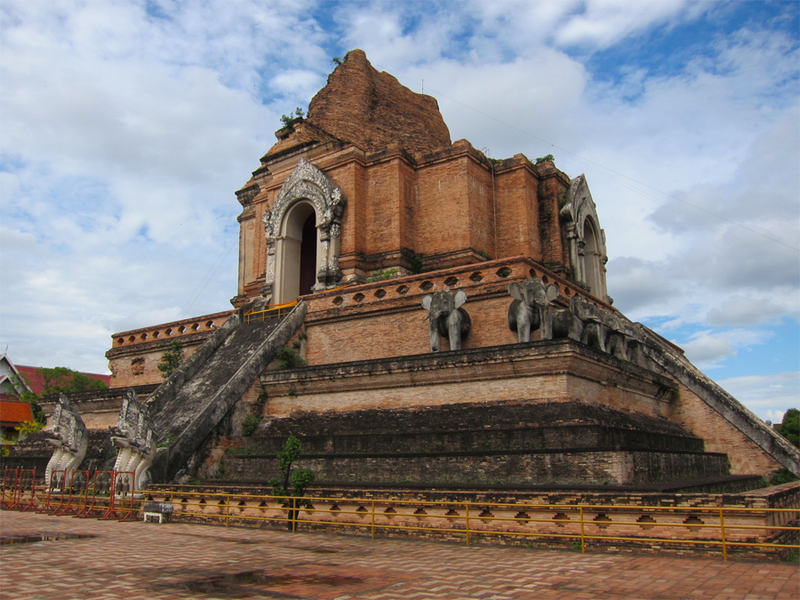 This immense temple is one of the most revered in Chiang Mai. It is also known as the Temple of the Great Stupa, named for its dome-shaped shrine. Built in the 14th century, it soared high above the city until an earthquake struck and destroyed its summit. Since then, the shrine has been partially restored. The temple rests on a large pyramidal platform. Elephant statues encircle the base halfway up the side. Long staircases lead to the top, flanked by pairs of serpents. Buddhas are enshrined inside arching alcoves. The temple grounds house two assembly halls. One has a burgundy roof and decorative gold facade. Inside, black and gold columns support the vaulted ceiling. Suspended from the beams are colourful banners trimmed in gold. Standing majestically at the altar is a towering gold Buddha. The second hall has an ornate, gilded entrance. Another open shrine enfolds a reclining Buddha. Crowning the temple grounds is a gazebo bell tower. A small chapel protects the founding city pillar, known as the Inthakin. A giant gum tree guards the entrance. It is believed to protect the city from misfortune. A special pulley system enables visitors to leave offerings and prayers at the shrine summit. 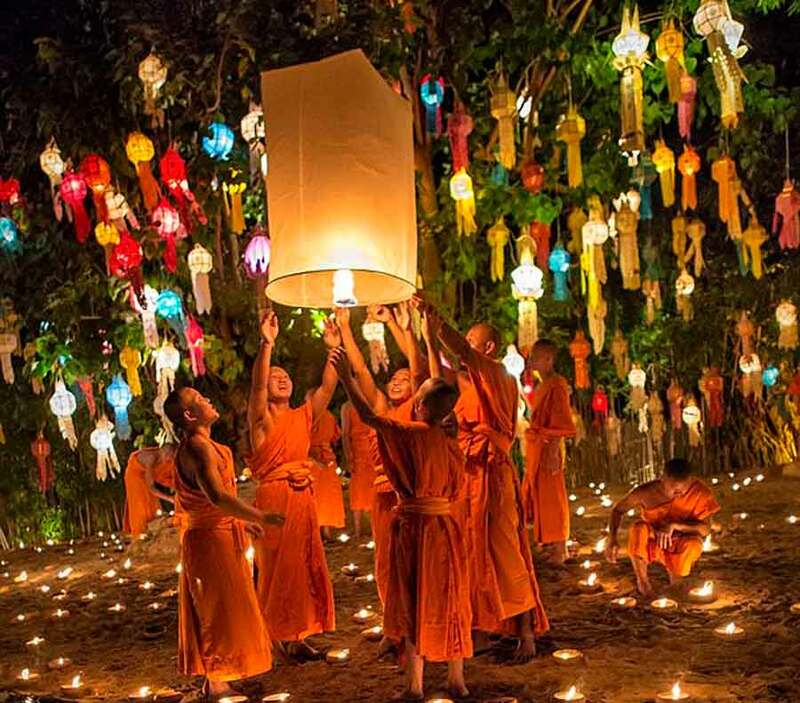 Thais love to celebrate, and the calendar year overflows with festivals. Here’s a beloved celebration held only in Chiang Mai. The Inthakin Festival is held annually in May. It honours the original city pillar. Ceremonies are performed to invoke happiness, peace, and prosperity for the city. The event features flower offerings, musical performances, dancing, carnival games, and delicious street food. On the afternoon of May 14, a sacred Buddha image will be taken from the shrine and carried through the city. People will sprinkle the statue with holy water. It is believed that those participating will be blessed with good health. Visitors are welcome to take part. A flower offering to the pillar is a moving event. A merit-making ceremony is also performed. Every evening, a carnival takes place on the temple grounds. Cresting the summit of Mount Suthep is Chiang Mai’s most renowned shrine. 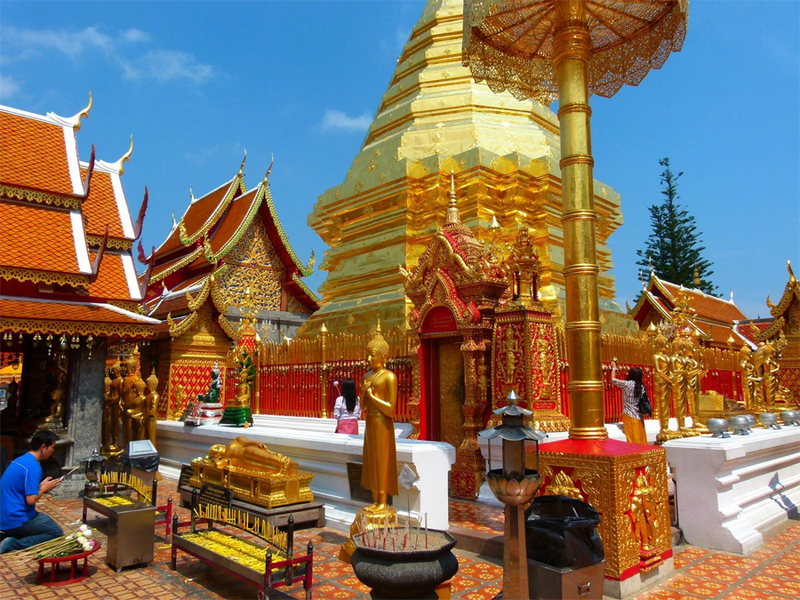 A pilgrimage to Doi Suthep is believed to make wishes come true. Begin your exciting journey at the foot of the serpent-lined staircase. You can either walk up the 300 red brick steps or take the lift. The temple courtyard is a study in gold. A resplendent spire gleams at its center. Buddhas in various poses stand among three pagodas. Alongside one shrine is a majestic white elephant. Within the wats, colourful murals dance along the walls. An Emerald Buddha is breathtaking! A large terrace offers sweeping views of the Chiang Mai countryside. Just beyond this is a huge gong, yielding a deep, rich tone. Visitors are welcome to ring it, as well as the many bells encircling the shrines. To make your wish and receive blessings, you first offer a gift. It can be a candle, flowers, or incense. Next, walk around the golden spire three times as you pray and make your wish. Then watch for your wish to come true! If one of your wishes is for good coffee and a quaint café, go to Coffee Wish. This colourful coffee house has an extensive beverage board. Highly-rated perks are the toffee nut latte and iced mocha frappe. Cakes are also great. You can curl up with your brew at an outdoor table or within the cozy living room. There’s also a coffee bar where you can perch and work, courtesy of free WiFi. A fun custom is Thailand is the observance of “colourful days.” It is derived from Hindu legend. Each day of the week is linked to a specific colour. On Mondays, yellow is worn to honour the day the King was born. Tuesday is celebrated in pink. Friday features blue, in deference to the Queen’s birthday. Below is a retailer of silk clothing to colour-code your days. Shinawatra is Thailand’s premier producer of hand-woven silk. Family-owned and managed for over 100 years, this company remains on the cutting edge of the most fashionable silk designs. It is a favored destination of visiting royalty and guests. The factory architecture is remarkable. Buildings feature burnt-orange brick, gabled roofs, immense teak columns, and exposed beams. All the walkways are beautifully paved with hand-made ceramic tiles. A fascinating tour is offered on the process of silk manufacture. The first gallery reveals how silk threads are harvested from cocoons. It then shows how they are reeled, spun, dyed, and woven. A second hall chronicles the history of famous visitors. There are separate galleries of apparel for women and men. The silk fabric room displays bolts in dazzling colours. Upstairs is devoted to home decor. The building also houses a promotion hall and souvenir shop. Staff members are friendly, patient, and service-oriented. Prices are reasonable. Bargaining is a common custom at small shops and street markets. Here are some tips for mastering the fine art of bargaining. 1. Dress for the part. You don’t want to wear an expensive outfit or jewellery. It gives the impression you have money to spare. A vendor won’t back down from an asking price if you’re dressed to the nines. 3. Bring small baht denominations. Separate bills and organise them in your wallet, so you’re ready when it’s time to pay. 4. Know the reasonable cost of an item beforehand. Go to different stalls and shops to gauge the average price. 5. Decide in advance the most you’re willing to pay for an item. Then be prepared to walk away if you don’t reach an agreement. You may find a similar item at a lower price as you continue shopping. 6. Begin the interaction with a bright smile. Sawat-dee Kha – “Hello” if you’re a woman. Sawat-dee Krup – “Hello” if you’re a man. Make your first offer at 20% below the asking price. Crunch the numbers on your calculator. Then you can try 30% below asking price. Gradually, work your way up. Ultimately, your offer can be up to 50% off the asking cost. Just remember that the vendor is entitled to a profit as a means to earning a living. The Sunday Walking Street is an eclectic showcase of art, crafts, music, and food. The road is closed to traffic, making for a massive marketplace. The Market displays the fine craftsmanship of local Thais. High-quality goods feature silk, fabric, glass, wood, ceramic, and metal. You will also find beautiful clothing and jewellery. Food is available from street vendors, cafés, and restaurants. After dark, the Market comes alive with performers and colourful lights. Browse and bargain while being entertained by bands, dancers, musicians, and puppeteers. If your feet get tired from shopping, enjoy a foot massage for 30 minutes at one of the local shops. Sharing food is intrinsic to Thai dining. At a Thai meal, several dishes are served for people to share. A typical meal consists of a soup, spicy dish, fresh vegetables, and several sauces. Condiments take center stage, and the other dishes encircle them. Each dish has a separate serving spoon. A diner begins their meal with a plate of rice. Then they spoon out a portion from one of the dishes, and eat it with the rice. Interestingly, in the Thai language, there is no word for high-chair. Young children often eat from a relative’s lap. The khan tok is a pedestal serving tray. In addition to bowls of food, it may hold candles, flowers, and fruit. The table is short and round with wooden legs. It may be fashioned of teak, bamboo, or rattan. The Khan Tok dinner is a custom unique to northern Thailand. It is accompanied by thrilling music and dance. The khan tok is a choice setting for weddings, festivals, housewarmings, parties, and temple celebrations. Midway through the meal, troupes of dancers arrive! Dressed in elaborate, colourful costumes, they perform the graceful movements of classical Thai dance. The evening comprises about two hours of magical enjoyment. Upon entering this spacious eatery, you remove your shoes. The atmosphere is bright, with suspended ceiling lights and a red colour scheme. The restaurant offers three seating options – floor, elevated floor, and Western. Portions are generous and promptly refilled. Staff members are friendly and attentive. If you make a reservation, you can obtain pick-up from your Chiang Mai Hotel for a small surcharge. Khum Kantoke offers fabulous food and entertainment served by courteous staff. Portions are plentiful. Service is attentive. Talented dancers enchant in colourful costumes. Indoor seating is provided on the floor with comfortable cushions. Table seating is available beneath an open-air pavilion. There are three menu options – khantoke, halal, and vegetarian. The management at Khum Kantoke is committed to providing an excellent dining experience. You’ll feel like an honoured guest. Although Akyra Manor Chiang Mai is a new kid on the block, we’re grounded in a strong tradition of hospitality. Enjoy the delightful customs of akyra Manor Chiang Mai!